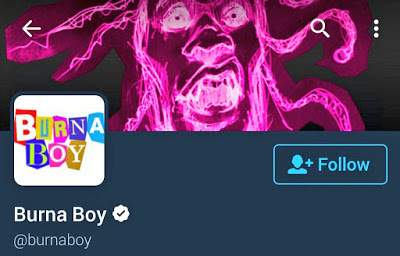 A graphic designer has taken to Twitter to put music star Burnaboy on full blast after he allegedly used his art work without payment. According to Chukwubuikem, Burnaboy's management approached his brother & his company to do full stage art work for them to use for @essencefest in Durban. After the concept document & bill was prepared & sent to Burnaboy, his management stopped picking phone calls & replying emails. Next thing they saw, an inverted version of the image was used as Burnaboy's Instagram photograph. Burnaboy & his management however went ahead to use an inverted version of th eimage on Burnaboy's instagram page as well as the stage mural for his performance in @essencefest Durban. Chukwubuikem is now seeking justice.